The best looking fitness tracker so far, but does the substance match the style? We know that the Tag Heuer smartwatch will go on sale later this year but legendary watch brand Mondaine is first out of the Swiss smartwatch blocks. 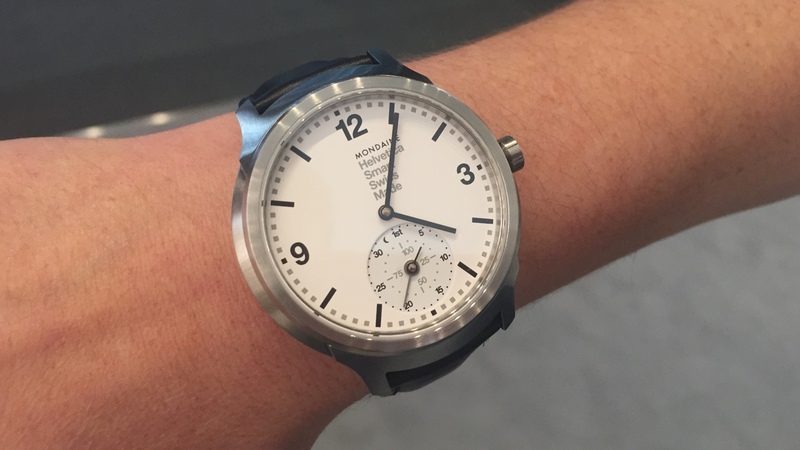 The Mondaine Helvetica No 1 Smart was announced back in February, before being demoed at Baselworld a month later. If we're being pedantic, the first Swiss smartwatch was actually the Withings Activité that, although designed by a French company, was manufactured in Switzerland and carried the prestigious 'Swiss Made' stamp. When it comes to design chops, Mondaine watches rule. Firstly, it has got the whole Swiss railway design going on, which is like having your smartwatch endorsed by time itself and, if that wasn't enough, the company has officially licensed the Helvetica font, which is enough to get the most ardent design nerds aquiver. And while the Withings Activité delivered fitness tracking features in a Swiss made watch long before Mondaine, the latter has the benefit of having an existing winning design, and the difference shows. The main face features those big bold numbers and dominating hands that are instantly recognisably as Mondaine, with thick bezels and dominating crown. It's a gorgeous looking watch, and an improvement on the rather medical looking Withings. While smartwatches such as the LG Watch Urbane and the Asus ZenWatch make a big deal of their leather strap offerings, the difference between those Android Wear devices and the premium Mondaine No 1 Smart are vast. Sure, you're paying around treble the price for the Mondaine, but you're rewarded with genuine luxury. It's chunky, we can't ignore that – much more so than a regular Mondaine – but not ridiculously so and, to compare to Android Wear again, it's not as bulky as the circular efforts we've seen emerging from the Google stable. At the bottom of the watch face is the secondary dial that offers an at-a-glance look at your progress against your daily goal. Unlike the Withings Activité, however, things are a bit more detailed than just a goal percentage. The big grey hand points to the current day of the month, while the second smaller hand rotates to show your step goal percentage. However, when you go to sleep, the date hand will move to the sleep position, and the second hand will turn to reveal the percentage of sleep. What's more, you can tweak the settings to enable the watch to track sleep from lying under your pillow, rather than on your arm, if you don't feel comfortable wearing the heavy metal watch to bed. Sticking with the sleeping features and the Mondaine Smart offers details on your deep and light sleep, the amount of time you were awake, and a count of the times that you awoke from the land of nod. However, you have to manually enter sleep mode, either by pushing the dial on the watch or by selecting the mode in the app. Smart alarms are on offer, however, to wake you during periods of light sleep and there's also a handy power nap mode for daysleepers. In terms of activity tracking, the usual fitness tracker mix is on offer: steps, calories and distances. As with any algorithmic metric calculation, there's an element of trust that the device is counting in the realms of accuracy but, compared to both a Fitbit and a Garmin fitness tracker, we found the Mondaine pretty much on the money. That's probably because of the tracking tech that's built in – Mondaine hasn't taken it upon itself to do the recording all by itself; it's all handled by MotionX – a platform from Silicon Valley based company Fullpower, which has jumped into bed with three Swiss watchmakers to do their smart stuff. MotionX also power Jawbone and Nike wearables, so it's a brand you can trust. Unlike the Nevo smartwatch, there are no smartwatch-esque notifications with the Mondaine Smart – it would have been nice for the watch to at least buzz when a text or incoming call came in, for example. The No 1 Smart is part of the Horological Smartwatch Open Platform; an umbrella organisation that will see a raft of new Swiss made smartwatches arriving in the near future from the likes of Frederique Constant. It's a new platform born out of a partnership between Silicon Valley based Fullpower Technologies and Union Horlogère Holding, who owns Swiss watch brands Frederique Constant and Alpina. As such, the app is a universal one for the platform, rather than the individual devices and, the app we tested our Mondaine review sample with, was very much a work in progress – it's not yet officially available in either Google Play or iTunes. So, we'll reserve judgement on some of the bugs we encountered – most notably the beta app thought our watch was a Frederique Constant device and we had issues aligning the date hand. Rather, we'll focus on what the app did offer. While not as comprehensive as what you might expect from the likes of Jawbone or Fitbit, you do get a clear overview of your activities and sleep, broken down by day, week or month. It's all a bit basic, and the graphics could do with jazzing up but the essential info is all there and easily accessible, and there's also the option of exporting data to data files or connected social media apps – at least there will be in the finished design. While we do feel some sympathy for Withings, which started the Swiss built activity tracker movement, there's no doubt we'd rather have the Mondaine on our wrist. By taking a classic design and adding tracking smarts, it was always going to win the wearability war. Mondaine watches are inherently wearable and the MotionX tech packed inside the company’s first connected timepiece hasn’t altered that fact. It’s simply stunning, easily the best looking piece of wrist-based wearable tech that we’ve come across so far. It could have fallen flat on its face if the fitness tracking aspects weren’t up to scratch but Mondaine avoided that embarrassment by enlisting the Silicon Valley experts and, while the app still needs some work, the essential ingredients are all there and the information is easily absorbable. Yes, it’s expensive, at $850, but you’re paying for solid Swiss Made quality. any update on the battery life? I know we're well over the 3 year mark now, I've purchased one of these recently in a fire sale and just put it in for a battery replacement as it arrived without power. Please confirm how it lasted if you can? Really appreciate the website, particularly this article and comments.